A number of great looking Chromebooks are seemingly on the horizon. First of all, there’s cheza which looks to be powered by the Qualcomm Snapdragon 845, the first of its kind. Then there’s an AMD APU-powered Chromebook too, which would mean that gaming could soon become a reality on Chrome OS. Combine that with likely Linux application support and it’ll make for a great combo. A device codenamed “Nocturne” looks to be bringing something interesting though. It’s another detachable, like the HP Chromebook X2, but it will also have a backlit keyboard according to a commit on the Chromium Gerrit. To clarify, the HP Chromebook X2 is the first detachable of its kind on the market. However, it does not have a backlit keyboard like Nocturne appears to have. As for Nocturne, what else do we know about the device? 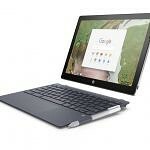 According to AboutChromebooks, a few different specifications have been revealed in the Chromium Gerrit so far. First, it appears that the resolution of the screen will be 2400 x 1600, just like the current Google Pixelbook. Early commits also suggest that it will be one of the few devices of its kind to have a fingerprint scanner to unlock it. Finally, it appears that it will run on an Intel Skylake processor but that is subject to change based on when it releases. But what’s the deal with a backlit keyboard? They can be great for typing in the dark so that you aren’t fumbling with keys. Also, they can look pretty cool too. With a number of high-end Chromebooks on the way, it looks like Nocturne may be set to join them too. The platform is looking to compete with standard laptops that you can buy on the market, especially for those looking for a multimedia or productivity device. With a detachable screen, you can watch YouTube or movies on a tablet-like display, for example. Not only that but if you have a stylus you could also use one for art or notetaking. These upcoming Chromebooks all look like they’ll offer up unique features, but which one is for you?